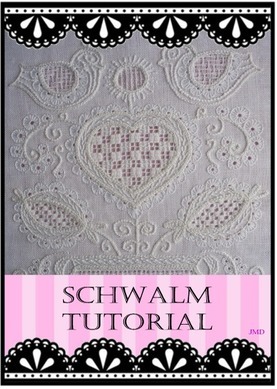 Schwalm is a German hand made embroidery, found as early as the 17th century. 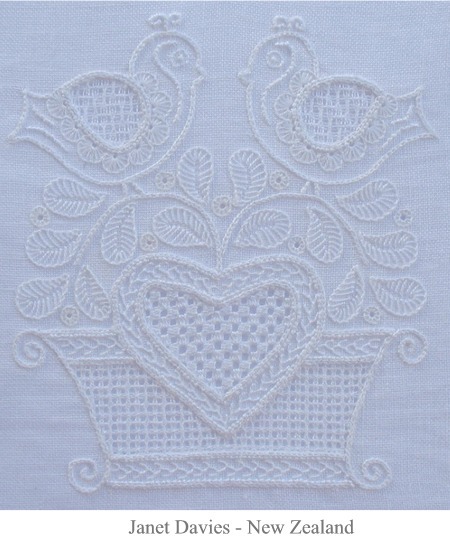 The traditional style of embroidery is easily recognised by the profuse use of hearts and tulips with scalloped edges. 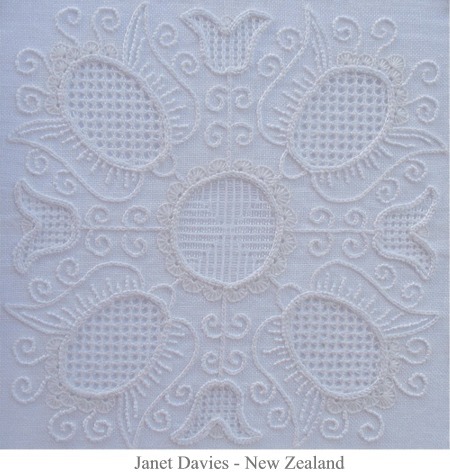 Also there are cut and pulled lace-like fillings inside some of the design shapes. 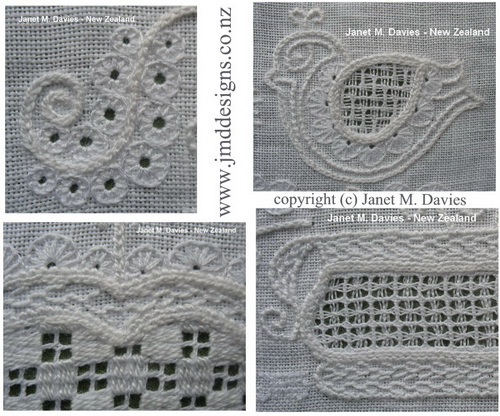 Woven Borders feature at times in traditional designs. 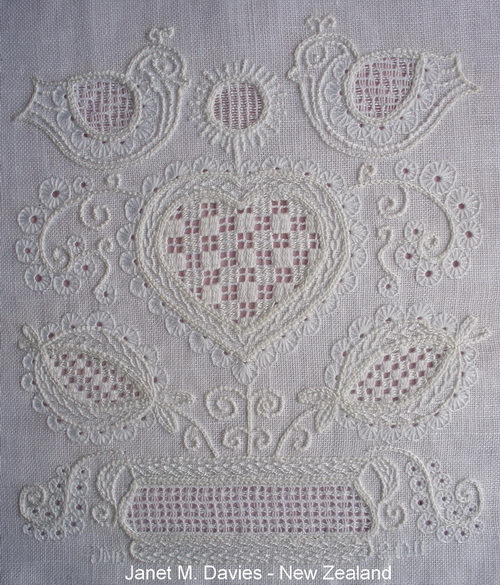 This embroidery style could be found on clothing and table clothes and runners. 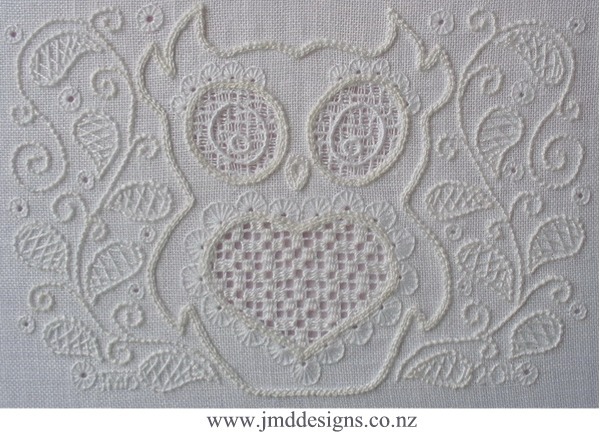 Many everyday embroidery stitches are used e.g. Buttonhole, Coral Knot, Chain, Herringbone and a variation on Pulled Thread fillings in a cut grid of fabric threads etc. A Crewel needle (sharp point) is used for stitching the design lines and surface stitching. For the actual Pulled Thread stitching, a Tapestry needle (blunt point) is best, as this helps not to catch a fabric thread when stitching. Traditionally close even weave linen fabric was used. But today a variety a linen and viscose fabric are used (#28 count or more). #28, means there are 28 fabric threads in an inch measurement. Also referred to as "28 count" fabric. Three different cut and pulled thread fillings are used in this Schwalm design. This design could be framed as a picture or placed on the front of a bag, photo album cover or cushion etc. This design pictured is 14 x 16 cm (5 1/2 x 6 1/4 inches). Three different cut and pulled thread fillings are used in this Schwalm design. This design could be framed as a picture or placed on the front of a bag, photo album cover or cushion etc. This design pictured is 19.5 cm (7 ¾ inches). Three different cut and pulled thread fillings are used in this Schwalm design. This design could be framed as a picture or placed on the front of a bag, photo album cover or cushion etc. This design without the border is 9.5 cm (3 1/2 inches). 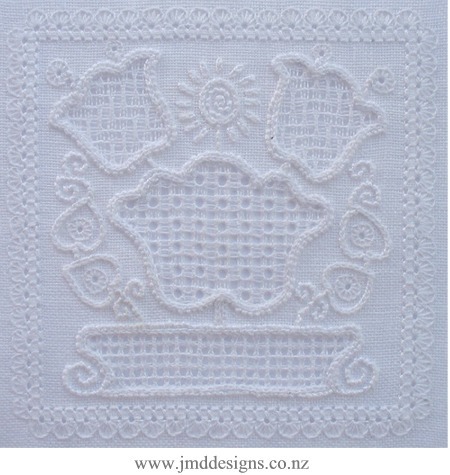 This design with the border is 11.5 cm (4 1/2 inches). Three different cut and pulled thread fillings are used in this Schwalm design. This design could be framed as a picture or placed on the front of a bag, photo album cover or cushion etc. This design without the border is 9.5 cm (3 1/2 inches). 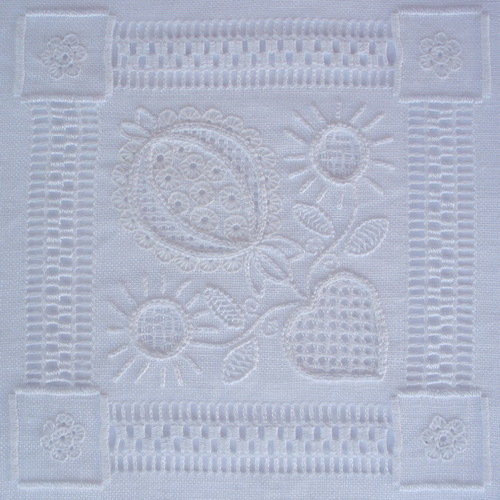 This design with the border is 16.5 cm (6 1/2 inches). 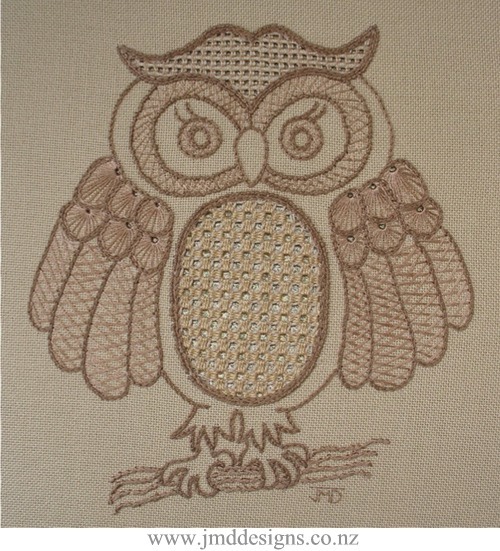 Contemporary Schwalm Needlework. The Owl is 13cm (5 inches) tall. 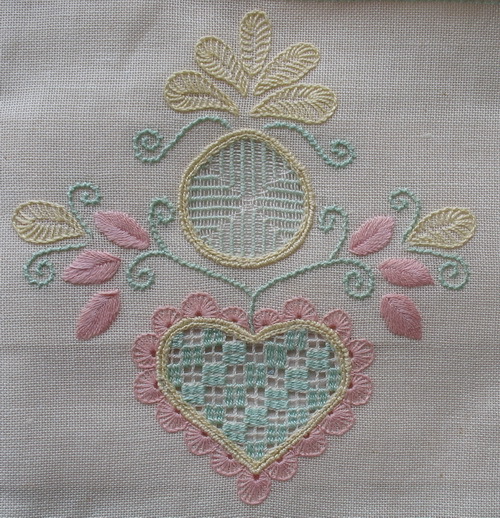 The centre heart shape has a grid of threads removed and then a woven pattern stitched in among the grid. In the eyes a fabric grid is cut and then pulled thread pattern stitched. Pearl 8 and 6 stranded cotton was used. Two different filings are used in this contemporary design, but an option of 6 different cut and pulled fillings are offered that could be used inside the design elements. This design could be picture framed or placed on the front of a bag, photo album cover or cushion etc. Enlarge or reduce the designs to suit your own needs. An even weave fabric must be used and suggestions are given. 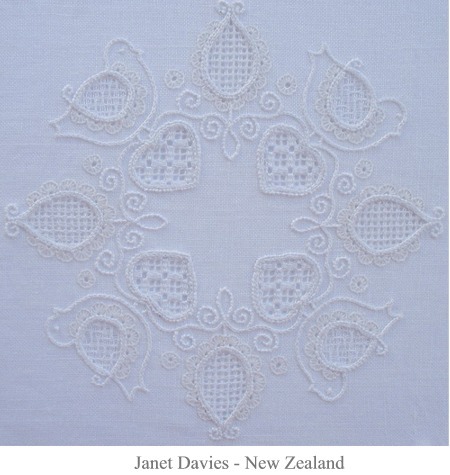 This design is featured in Janet's book. This design pictured is 32 x 23cm (13 x 9 inches). This page is not to be copied or cut and pasted into other websites. Links to this website are more than welcome.